POINTS UCI This event is considered as “C1” by the UCI calendar. Any points awarded will be done in respect to the UCI rules. The whole area of the race is closed for car entrace from 8:00 !! 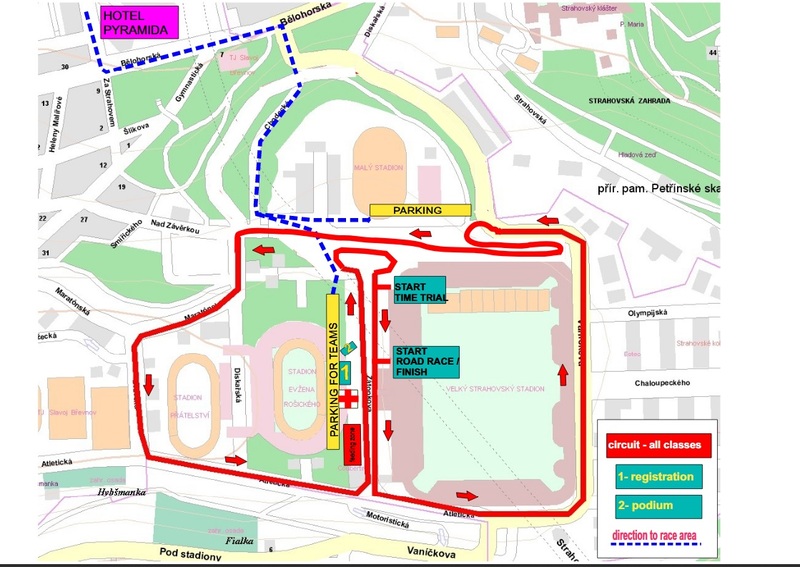 THE ACCESS ROAD TO THE RACE AREA - please respect that the whole race circuit and the access roads form Prague 5 - Smichov will be closed from 8:00 till 18:00 during both race days !!! The access road (see the map) is from Prague 6 – Brevnov. Prefer this way please – Belohorska Street, then Chodecka Street (under the viaduct). From the part of Smichov, use the Strahov tunnel please and then continue on Pod Kralovkou Street and you will get to the above mentioned streets. ANOTHER APPOINTMENT The competitors, staff and visitors are participate the competition in own risk. All are obligatory keep traffic regulations, instruction of policeman and organizators. Important changes will be announced by www.caths.cz/ecp/ or by mail. or make booking directly with the hotel !